In 1904, the FIFA (International Federation of Football Association) created by the French journalist Robert Guerin and who contains 7 Member States, decides to set up, at the time of its first congress, an international competition of which the first opus must take place in Switzerland the following year. But under the pressure of the British, this project does not lead. 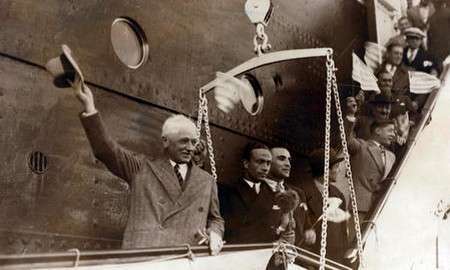 It is only in 1924, in Paris at the time of the Olympic Games that Jules Rimet, then President of the FIFA (it remained it of 1921 to 1954), understood that HIS world cup of football could become reality; indeed, in front of the play provides by the Celeste (name given to the team of Uruguay for its colors sky and white) and the presence of country like the United States of America (the Usa) or the Egyptians, how not to imagine a competition reserved for football where all the artists would be present (the Olympic tournament being practised only by amateurs, was not representative any more of football). Four years later, to Amsterdam, Olympic city, the news fell : a great competition open to all the affiliated federations will be created into 1930 and will bear the name of World cup; this declaration of Henri Delaunay, Secretary-general of the FFF (French Federation of Football) and President of the commission of study made following 2 years of reflexion. Several European countries proposed to organize it but in front of the double Olympic title obtained by The Celeste on the two last olympiades, the choice was sealed: it will be Uruguay which by the same occasion will celebrate first centenaire of its independence. 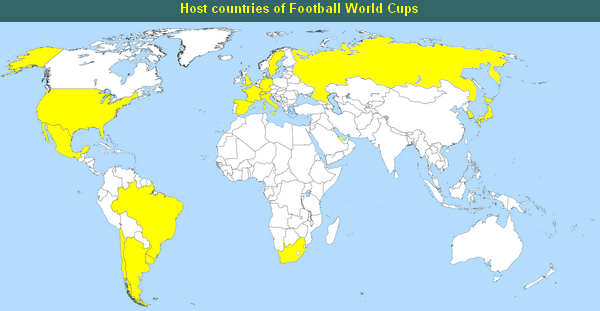 Thirteen countries will take part in this world cup including 4 Europeans only: Yugoslavia-Romania-Belgium Mexico-Chile-Argentina-Brazil-Bolivia-Peru-Uruguay-Paraguay-Usa-France (one will note the absence of England, ground where was born football). The creation of the trophy is entrusted to Abel Lafleur, French goldsmith; its name : - The victory with the gold wings - of 30 cms and 4kg of solid gold. This one having been gained 3 times by Brazil (1958-1962-1970), it became its possession about it. The current one (which goes back to 1974) was signed by Silvio Gazzaniga (Italian) and weighs 1 kg of gold moreover was gained the 1st time by Frg in 1974 over its ground. June 21, 1930, in bay of Villefranche sur Mer, the trophy embarks on the Conte Verde bound for Montevideo... Arrival scheduled for July 05. 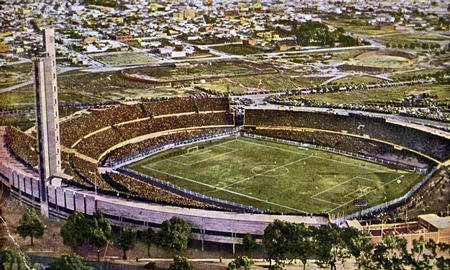 All is in place when Sunday July 13, 1930 front nearly 2000 spectacteurs, Lucien Laurent marks at the 19' of play the first goal of the first world cup of football. This first match against the team of Mexico finished on the score of 4 goals to 1 for the team of France directed by Raoul Caudron (small detail: it snowed!). More late, and if one considers that the first matches were televised in 1936, it is only at the time of World Cup of 1954 in Switzerland that the first televiewers could enjoy eight matches on line. 22 years after, Edson Arentes Di Nascimento more known under the name of Pelé becomes the youngest winner of the world cup at 17 years and 8 months Sunday June 29, 1958 in Stockholm at the time of the finale Brazil-Sweden (5-2). Then, the world cup 1998 in France inaugurated a new formula with 32 countries and the golden goal from the Round of 16 whose principle is simple: 1st which marks during the extra time the match gains (this formula had been inaugurated during the Nations European Cup in 1996 and the German Oliver Bierhoff was the 1st - Gold striker - at the time of the finale). At the time of the match of 1st turn Usa-Colombia (2-1) in Los Angeles in the Usa Wednesday June 22, 1994, Andres Escobar (Colombia) mark against its camp with the 35' minute of play. Saturday July 02 after Colombia was eliminated, this one is assassinated in full downtown area with Medellin. For the first time in 2002, the organization of the football world cup was given to two different countries: South Korea and Japan; during this competition, Brazil and Germany met for the first time.